NOTE: PER NFL RULE! This Free Agent Combine Is NOT For Graduating College Seniors. 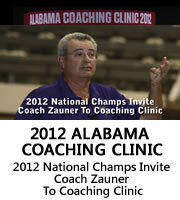 Check out Coach Zauner's College Senior Combine. This Arizona Football Kicking Combine is specifically designed for Free Agent Kicking, Punting and Snapping Specialists who are seeking to gain exposure to NFL and CFL Football Teams. Specialists must qualify to participate for this Combine. The only specialists except from qualifying are veteran NFL players or specialists that have signed NFL contracts and played in NFL pre-season games. Specialists also have the option to qualify the day before the combine on Sunday March 10, 2019 or at any Coach Zauner PRO Development Camp in January, May or July or during a ONE on ONE Kicking, Punting or Snapping Lesson or Evaluation by appointment. It was Joe Marciano (long time Special Teams Coordinator) who asked me at the 2008 NFL Combine Special Teams Coaches dinner, to build my Field of Dreams; a Free Agent Football Kicking Combine which assembled elite kicking talent for the National Football League (NFL) and Canadian Football League (CFL) Coaches, Pro Scouts and Personnel Directors to evaluate. On April 6, 2009 that dream came true when 32 NFL and CFL teams, coaches and scouts came to Phoenix, AZ to watch 41 kicking specialists showcase their talent. To avoid a late fee all registrations and payments must be received on or before February 28, 2019. All registrations and payments received on or after March 1, 2019 will be subject to a $75.00 late payment fee. EVALUATION FEE: $350.00 fee will apply to the $625.00 Free Agent Specialist’s Combine Registration Fee for those who qualify to participant in the Combine. All participants must register on-line. To avoid a late fee all payments must be received on or before February 27, 2019. All payments received on or after March 1, 2019 will be subject to a $75.00 late payment fee. Accepting check (payable to Coach Zauner, LLC) Visa and MasterCard (Credit Cards Subject to 3% Convenience Fee). 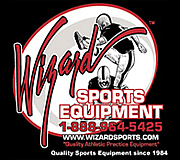 Specialists to bring tennis shoes, one football (initialed), kicking shoes, kick off tee, holder and workout equipment. Combine testing will be conducted with NFL Footballs (K Ball). Arizona Kicking Combine to be held at an outdoor facility and will be conducted regardless of weather conditions. Combine schedule subject to change without notice. Specialists will be issued a Coach Zauner Combine shirt. College Senior Combine Also Produces Results! It was Joe Marciano who asked me at the 2008 NFL Combine Special Teams Coaches dinner, to build my Field of Dreams; a Free Agent Football Kicking Combine which assembled elite kicking talent for the National Football League (NFL), Canadian Football League (CFL) and United Football League (UFL) Coaches and Pro Personnel to evaluate. Each year I will be hosting the Coach Zauner Free Agent Specialist’s Football Kicking Combine in Phoenix, Arizona. Over the last few years I believe I gathered a solid group of Coaches, Pro Personnel and Scouts who represented 26 NFL, 2 CFL and 4 UFL teams. I hope to expand the number of NFL, CFL and UFL teams who attend the Free Agent Specialist's Football Kicking Combine. It is my my goal to make sure this event is comprised of the highest caliber kicking specialists, so only those individuals I had worked with, evaluated and invited were allowed to compete. The fact that 17 of the 41 kicking specialists who attended the 2009 Combine were eventually signed to NFL, CFL or UFL contracts during the 2009 season, attests to the quality of the talent who competed. For those kicking specialists I hadn't previously worked with, there was a one day 'evaluation' session which I used to qualify individuals for my Free Agent Specialist’s Football Kicking Combine. I will be conducting a similar 'evaluation' process each year as well to ensure the 'quality' of kicking specialists participating meets -or exceeds- the needs of the teams attending. Each year I will adjust the date for the Free Agent Specialist’s Combine to avoid interfering with teams preparing for the NFL's Draft. Hopefully this will make it easier for the teams to plan their schedules. Arizona's weather is great even in late March, so for those who want to fly in a day or two early, there are some wonderful golf courses in Phoenix to be enjoyed. I look forward to seeing you at my Annual Free Agent Specialist’s Football Kicking Combine. Whether you are a team looking for talent, or talent looking for a team, I'm sure you will find it a very valuable experience. Bobby DePaul, Senior Director of Pro Personnel for the Chicago Bears said, "This was the best run Free Agent Combine I have participated in during my 21 years working as a coach or scout in the NFL. This effort clearly demonstrated that Coach Zauner has the knowledge needed to run an efficient Combine and effectively evaluate kicking specialists. I will be looking forward to an expanded field of kicking specialists next year." Russ Purnell, Special Teams Coordinator Jacksonville Jaguars said, “Gary put together a highly organized, efficient and competitive NFL Free Agent Specialists camp that featured very realistic skills tests and top level participants. Coaches and scouts were able to evaluate punters, kickers and long snappers in a structured environment. The weather and facilities were outstanding. The time spent was an investment in the future. It was as good a camp as I have been to." Ray Rychleski, Special Teams Coordinator Indianapolis Colts said, “As a coach I can really appreciate how well and precise the entire event was run. Many of the other special teams coaches and personnel people in the stands who have gone to other combines remarked that this was the best run free agent camp they had gone to and will be back again next year. 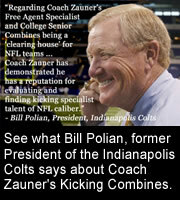 Coming from the college coaching ranks I would think any college or free agent kicking specialists that wants to get exposure to the NFL should make Coach Zauner’s combine a must to attend." Scott Player, 13 Year NFL Veteran Punter (Cardinals & Browns) said, “I feel that in only the first year of putting together a special teams combine, Coach Zauner has already established that his combine is the major league's of kicking, punting and snapping. There is not another combine or camp out there that even comes close to this with the exposure a player can receive from all the various professional leagues. Coach Zauner is the premier kicking, punting and snapping authority in the country and that is why he has been able to attract some of the best players out there who trust him to help them improve their kicking technique and take their game to the highest level!" Signed with UFL New York Sentinels.